The first challenge to the Western hegemony that followed the collapse of communism in Europe was the emergence of the so-called Brics countries - Brazil, Russia, India, China and South Africa - in the 2000s. Rapidly growing and collectively accounting for nearly half of the world's population, the rise of the Brics seemed set to tip the balance of power away from the United States and western Europe. Today, the Brics look like less of a geopolitical threat to the West. Russia, Brazil and South Africa are in severe economic straits, and China is wobbling. Only India maintains its lustre. And yet the West is coming under pressure again, including in its own backyard. This time, the challenge is political, not economic - the rise of politicians who relish conflict and disdain national and international law and democratic norms. I call such leaders "PEKOs", after the four most prominent examples of their kind: Russian President Vladimir Putin, Turkish President Recep Tayyep Erdogan, Polish politician Jaroslaw Kaczynski and Hungarian Prime Minister Viktor Orban. PEKOs do not view politics as the management of collective emotions in order to achieve broad policy goals - faster economic growth, a more equitable distribution of income, or greater national security, power and prestige. Instead, they regard politics as an endless series of intrigues and purges aimed at preserving personal power and privilege. The PEKOs share the Russian revolutionary Vladimir Lenin's belief that "politics must take precedence over economics". Indeed, they value it over every other kind of policy consideration. Politics is not a means to an end but the air they breathe, and policies are merely instruments in their endless struggle to stay alive. It would be a mistake, however, to think of the PEKOs as today's equivalent of the "Great Dictators" of the 1930s. The PEKOs may be nationalists, but their opinions would not have been out of place in the drawing rooms of Europe before World War I (the same cannot be said of the Nazis or the Spanish Falange). 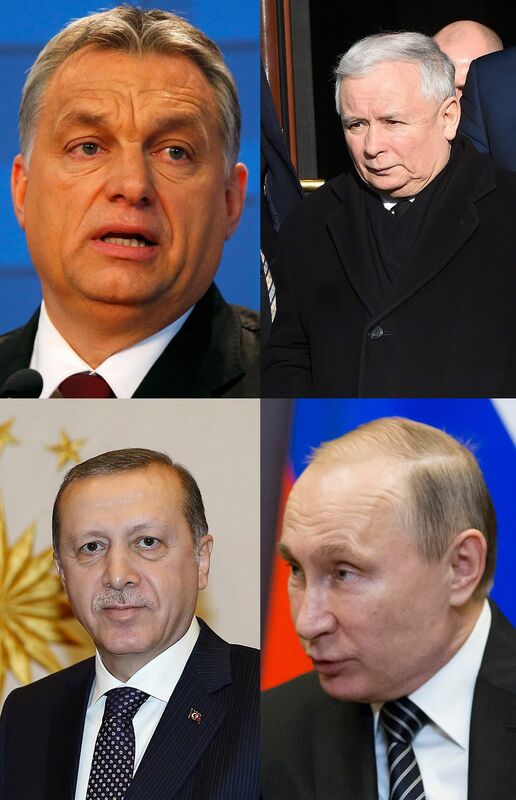 PEKOs are named after the most prominent examples of their kind (clockwise from top left): Hungarian PM Viktor Orban, Polish politician Jaroslaw Kaczynski, Russian leader Vladimir Putin and Turkish President Recep Tayyep Erdogan. Nor is their economic approach necessarily statist. Mr Putin certainly has strong dirigiste leanings, but if Mr Orban and Mr Kaczynski are deserving of the label, then so was French president Charles de Gaulle. And Mr Erdogan has actually dismantled Kemalist statism in Turkey and introduced free-market policies. The biggest difference between the dictators and the PEKOs is that the latter regularly have to face their electorates. Indeed, their confrontational politics is the central element of their survival strategy. Each one of them has gained (or maintained) power by polarising their societies and mobilising their electoral base. The PEKOs' political style has been enabled by modern news media, which, scrambling for audience share, simplify and sensationalise issues. Starkly antagonistic statements and positions tend to gain the most exposure. This gives confrontational politicians a powerful advantage, and produces the electoral polarisation on which the PEKOs have fed. This political strategy is undoubtedly effective. In Russia, for example, real wages fell by more than 9 per cent last year, and the share of Russian families that cannot afford adequate food or clothing has increased from 22 per cent to 39 per cent. Yet Mr Putin's approval rating is 80 per cent. Unlike the emergence of the Brics, which ultimately was a boon to the world economy, the rise of the PEKOs poses a real threat - especially as they begin to apply their confrontational approach to global economic governance and foreign affairs. International firms should be particularly concerned. Having spread their operations across the world during the quarter-century since the fall of communism, they have become dependent on rules-based stability and economic integration. Their fortunes will increasingly depend on developing strategies to avoid (or at least hedge) the new risks posed by PEKOs. To make matters worse, the PEKO phenomenon seems to be capable of spreading even to the heart of the West. Examples include Scottish and Catalan nationalists and British politicians campaigning to pull the United Kingdom out of the European Union. Those who champion these causes have been shockingly dismissive of the massive economic damage their proposals would likely cause their own societies. Similarly, in at least two major Western democracies, serious candidates for the highest office are acting like PEKOs: US presidential candidate Donald Trump and France's National Front leader Marine Le Pen, who will seek her country's presidency next year. If their bids for power succeed, the dangers posed to global stability will rise by an order of magnitude. • The writer was minister of finance and deputy prime minister of Poland from 2007 to 2013.